As God continues to unwrap things for us in Tallinn, it's exciting to see how things are developing. We naturally compare things to the early days in St Petersburg, as our only previous experience of arriving in a new country, with a new language and culture, and starting to church plant. One thing that has stood out here is this time, in some areas, how fast things are going. Some of this is down to the practical differences, I'm sure. In St Pete's it was our first time in the city - we needed to learn the city (which is a large place to learn!) and then find somewhere to live - our things then arriving a month after we moved in, so much so that we'd been in Russia 5 weeks before we had any real furniture in our flat - effectively camping out for a month in what was a very expensive tent! In Tallinn we already had somewhere to move straight into, going the short distance from the airport and then into our new rental apartment. And because it was mainly furnished, even though our furniture took about two weeks to arrive, we could live straight away. And because we had visited the city several times before, we knew the city (which is a lot smaller) and also knew some people. So we kind of hit the ground running, while still dealing with the transition and adjusting our daughters to living in a very different way. And that 'hit the ground running' kind of feeling has been a theme - we are now about 6 weeks into time in Estonia and what we've been involved in already has been a surprise and joy. We've got to know two churches - sharing at one already, preaching at the other. That was my first ever preach in Estonia and will be followed by three more over the next 6 weeks as they want me to finish the series I started on the book of Ruth. We've also met with others Pastors and this week I met with another. This week we would have fed our 11th person as well as having already gone somewhere as guests for dinner. 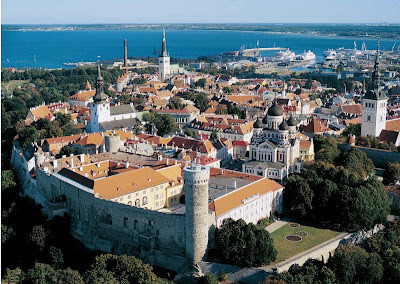 In the next two months I will travel a bit as well - next week to central Estonia where there is a relational group meeting of like minded men and women. It's the first time I've met most of them so that should be a good time. In May I also will travel to Riga for a conference and then after that, to a city at the bottom of Estonia on the Latvian border, where they've asked me to help out at their Alpha Holy Spirit day, taking some of the teaching and helping in the ministry time after. At the end of April I will also go to the monthly Tallinn Pastor's meeting, and build relationships there, I hope. Now lots of this did open up in Russia in time, just not so quickly, so it is exciting to see what will come of this 'fast' start. Due to visa reasons, I didn't actually preach anywhere other than in Hope Church while in Russia. So maybe it's partly the freedom of life here, back in the EU, that has opened things up more for us? When we arrived in St Pete's, joining Dave and Hannah, that did give a team from the start, with the two families. We were quickly joined within two months by Nadia and Johanna, so by the end of the second month in Russia, we had a team of 6. That isn't going to be the case here by the end of April. Back then those 6 were the only 6 people we knew, and that was just starting, because we didn't actually know each other before arriving, so the first 6 months was spent getting to know one another and our surroundings. So we don't have anyone on the ground with us here, yet! But this last month there has been a family 'wondering' about joining us, for which we are praying they do! And this week a girl from Hope Church is visiting us, having already told us she feels called to join us in Tallinn. So maybe by the summer we will have a group of at least 5 adults together - the starting of a team. And that would be just great! We of course share this to give glory to God. As I've said many times, when we look at ourselves, we think there is no way God can use us, no way that he could work through us - because we see all our weaknesses and know that there are others that he could really use - but as for us, no chance. The Bible is so true when it says that he takes things that aren't to display his glory - that he uses the foolish things to shame the wise. I don't know who the wise are, but when I try and think it all through - learning another language when I'm still trying to figure out Russian, seeing a team come together, facing the challenges that are coming up, starting a church, buying a car - I feel so foolish in it all and wonder if God really has the right man here. That said, there is no place in the whole world that I'd rather be. Better that I be a foolish man around the plans and purposes of God than in a place I seem wise, but God isn't with me nor has he called me to be there. And I do see that God is growing me - he's growing us all in what we are seeing. In the 4 years since leaving the UK, I've changed in more ways than just 4 years of growth could do. God is about a great work in us all, and I don't want to miss out on anything that he personally has in store for me - and I encourage you to not miss out either for your life. As for what has happened in April, to fill those of you in who've been following developments through March, we have been trying to keep to the routine this last week, with Mia's home schooling and such. We invited Leo and Shani around on Thursday night for food - they were starting Passover the following day. It was an interesting time. Mia and Anya didn't settle at all and therefore it was a very disturbed time. Being here in Tallinn for very different reasons, what was hard was how negative they were about things here and the people - we were defending life here. We are so grateful that Jesus is helping us to love those around us, so that we can move to a new nation for God and feel this heart connect that doesn't come from another calling in life - be it business or any other reason. And Sunday was Easter in Estonia, as we are now back on the Western calendar. This week I am meeting with three banks and asking about a home loan - one was earlier today and two on Wednesday. Please pray for great favour and that we'd get the outcome we are praying for. We need God to work for us in this. I'm also meeting with another pastor for the first time on Wednesday, and we have another Estonian lady around for dinner on Tuesday night. We also really need prayer for break through with our UK house situation - we'd love there to be a buyer that we hear of this month - the time is coming when we need to make some big decisions. So please pray favour upon favour on us all this month and especially this week with these three meetings at the banks. Thanks for reading - until next time! Because arriving home from the bank and checking email, there were two very interesting emails awaiting me. The first was a car dealership here with a quotation for a car we'd seen last week - we are still praying about the way through for this - but the next email stopped me in my tracks. It was from the developer of our new apartment, saying that progress was going really well and that it will be ready on 1st May! A whole two months early! Oh wow. What is comforting is that this week I'd arranged, I thought randomly, to meet these three banks. Yet God knew all about this. Now the timing of these meetings is crucial. We have less than a month to sort out this home loan, which we are told is possible to do well within this time. We do have the issue of our rental flat - we signed the contract until the end of July, thinking that we'd only be taking the new apartment from that month, and not in May. We are hoping that, assuming we don't need it in July, we will be able to get out of the contract early. There does seem an option here already. I'll spare you the details about what the banks were each saying up to now - just to say please pray! So it's going to be a roller-coaster month - and I'm still praying we can get this car soon as well now, especially if we are going to be living a little further out, and sooner than we thought yesterday. There's never a dull moment. We are doing well in it all, I think. Do pray that it all comes together. We do see God totally knew what he was doing when directing us to come here earlier than previously planned. Can you imagine if we'd still been in Russia today and got that same email - that from 1st May the flat would be ready and we'd need to be here to sort everything out. It would have been so much harder in that case. So, confident God has this all within his care for a long time now already, we'll push all the doors these coming weeks, and some way, some how, find the right way through it all. It's very exciting to think that in the next two months, we could be in our new apartment already (with another beautiful rental flat sitting empty in the middle of Tallinn as well....) We'll keep you posted and we appreciate every single prayer so much! Tim, we were given your name from a friend we've known for a few years. We're interested in what you're doing in Tallinn. We are moving there this coming week and would love to talk. Email me at lauradoyel@gmail.com.